Hello all. Well today's post is a bit different. i am not posting a card today but rather a flyer showcasing my hubby's truck that is for sale:( I am sad to see it go, it has been such an awesome truck but it is time to move on! Now, i know that this post might only apply to those that check my blog that are in the area where we live, unless you feel up to taking a drive to the Mitten State that is:) But, nonetheless, i didn't think it would hurt to post it! 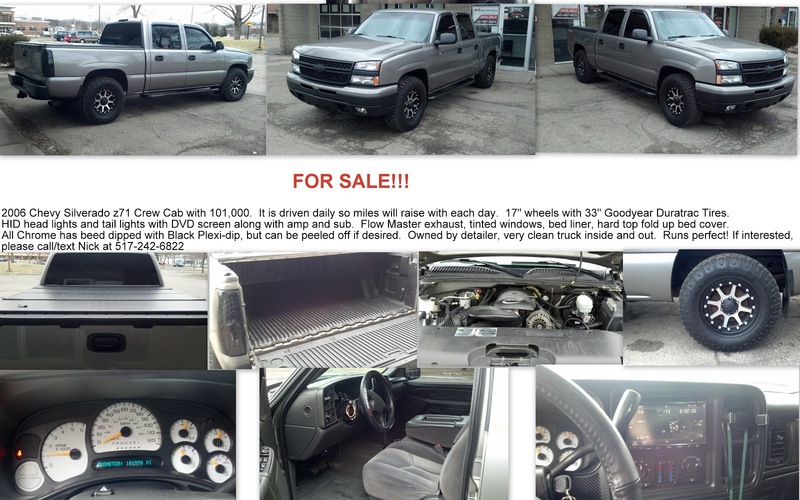 This is a 2006 Chevy Silverado z71 Crew Cab that is in excellent condition. My hubby is a professional detailer so you know the truck is going to look like new!!! There have been lots of little extras that have been done to it like Flow Master Exhaust, tinted windows, touch screen stereo system with amplifier and sub along with many more!